The benefits of entering expenses as Bills instead of Spend Money transactions. Ever wondered if there’s a better way to manage staying on top of supplier bills? Carmen Morris discusses entering expenses as Bills in Xero and the benefits this offers. Most people are very familiar with entering income as Invoices. This is the go-to method for most businesses where the customer needs a copy of the invoice before, or at the time of, payment. It’s very useful because you can track who owes you how much, when and for what. However, on the expense side, many businesses don’t enter them as Bills, which is the expense equivalent for Invoices. Two ways to enter both income and expense in Xero. Via a sales Invoice, which can be accessed from Accounts > Sales > New > Invoice. Via a purchase Bill, which can be accessed from Accounts > Purchases > New > Bill. Why then do so many people enter their sales as Invoices and their expenses as Spend Money? Simply put, it’s quicker and most people probably don’t realise that there could be a better way. So what are the benefits of entering expenses as Bills? The disadvantage of entering Spend Money transactions is that most people rarely enter the supplier bill number, largely because this is absent from the bank feed window unless you click a few more buttons. Also, if you’re paying multiple invoices at once, you can’t enter a single, unique reference number. Entering each individual supplier bill as a Bill in Xero will prevent you from entering a duplicate, as Xero will warn you if you attempt to enter the same bill number twice. Just be mindful that if you have multiple people entering bills in your business that everyone enters them the same way. For example, with or without leading zeros, as reference number 012 is unique from 12. One of the benefits of entering expenses as Bills is that, just like sales Invoices in Xero, you can see a list of who you owe, how much, what for and when it’s due. That way you can plan ahead for cash outflows. This leads on from the previous point. If you have entered every supplier bill exactly as per the document received, you can reconcile all of your purchases back to the statement from the supplier. This is particularly useful where you make multiple purchases from the same supplier and want to make sure that you’ve captured everything. If bills are omitted, then the profit may look deceiving high. This point is closely related to the one above. If you have good records about every bill ever received from a supplier, then you can easily access information about payments made or credit notes applied. If a supplier ever tries to chase you for payment of a bill they claim hasn’t been paid, you can quickly defend yourself. You can save yourself a huge amount of time down the track by having this information easily accessible. One of the beautiful things about accounting software is the ability to enter the banking details against the supplier contact. This facilitates simple and accurate payment of supplier bills. One of the drawbacks of paying suppliers directly from the bank account manually is that it’s easy to make mistakes. Bills can be added up incorrectly and reference numbers for the bills being paid can be wrong, which just makes life harder for everyone. By selecting the Bills for payment in Xero, you can check the total amount being paid, export a batch file out of Xero, import it into internet banking, check that imported file and then authorise it for payment. Only one withdrawal leaves the bank account and the Bills are already marked as paid in Xero, expediting the bank reconciliation process the following day. Once batch payments are in use, suppliers can receive remittances at the click of a button. They’ll receive something that looks like a statement showing a list of bills paid and the date that you have paid. They’ll apply payment to the right invoices in their system and everyone will be happy. By entering Bills, the Profit & Loss report will show the expense on the day that it was incurred, not when it was paid. This is hugely useful for a couple of reasons. Firstly, if you are delaying payments to suppliers due to cash flow issues and entering the expenses as Spend Money transactions, then recognition of expenses is delayed causing distortion of the total monthly profit. You can be deceived into thinking that things aren’t as bad as they really are. Secondly, tax deductions can legally be claimed sooner. By having more expenses in the current financial year, the business can declare less profit and therefore needs to pay less tax. Over the long run it makes no difference to the total amount of tax paid, but it’s worth remembering that a dollar today is worth more than a dollar a year from now. 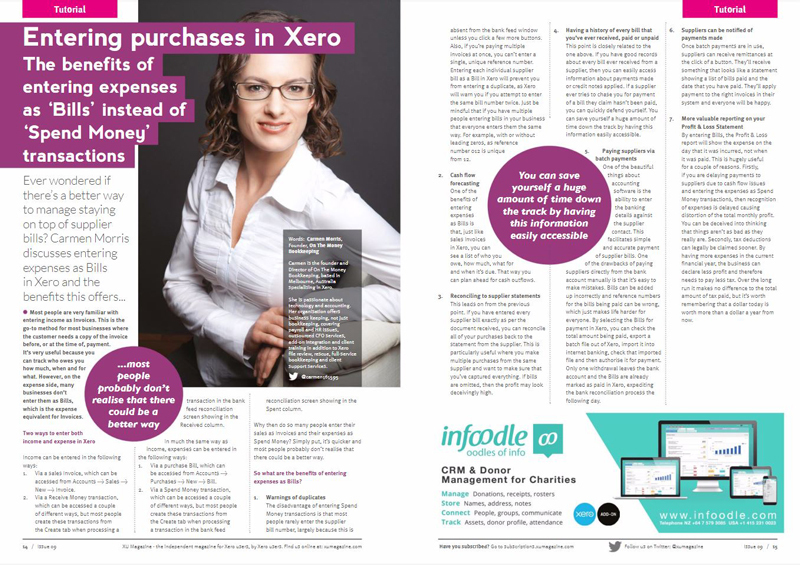 This article was published in Edition 09 of Xero Users Magazine on pages 14-15.